Our premium grade HDMI cable is High Speed certified to unleash the full capability of your Blu-ray or HDMI enabled device (PS3, Xbox 360, Roku, HTPC). High Speed HDMI cables will fully handle 1080p video content and other technologies, such as 4K x 2K (resolutions higher than 1080p), 3D (HDTVs with 3D), and Deep Color. When delivering 1080p content and more, a High Speed HDMI cable is recommended over a Standard HDMI cable (Standard HDMI cables are limited to delivering only 1080i content). High Speed HDMI cables include an Ethernet channel, which integrates networking capabilities to the HDMI cable at speeds of up to 100 Mb/sec. Our HDMI cables are made with the highest quality materials and include a braided shield, PVC jacket, gold plated contacts and ferrite cores to reduce noise and boost video performance. 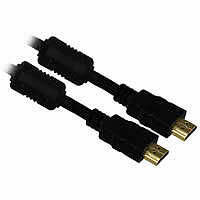 Furthermore, our High Speed HDMI cables come in different lengths for your convenience. For delivering a true home theater and gaming experience, we recommend our High Speed HDMI (v1.4) cable with Ethernet support.